Is the Eritrean Orthodox Church heading to the footsteps of Biblical Babylon? For the last 27 years, Eritrean Orthodox Church has expanded rapidly in the world with the help of immigrants. However, the PFDJ controls most of the Church day-to-day activities through its agents. These Agents are trained Political Cadres who work under the cover of priesthood, deacons and Sunday Bible Teachers and Activity organizers. Although the Church followers are political refugees, in most cases they have no other alternative but attend church centers managed by these PFDJ sponsored agents. Bevause of this, there are occasional conflicts inside the churches. The video below is a scenario happened in Milan, Italy. The people are chasing out the PFDJ Agent Priests from the church. It is sad to see the conflict between the people and the ruling regime members in the side the church. This is the beginning of the greater to come civil unrest in Eritrea. I call all Eritreans and other concerned international bodies to do thorough studies in order to find reconciliatory solutions before it becomes too late. Otherwise, there will be another Babylon phenomenon in Church. In this video below, the General Secretary of the Eritrean Orthodox Church Synods, Abune Lucas has accused Eritrean Patriarch Abune Antonios as one who did traison by following other dogmas which is not accepted by the Church. 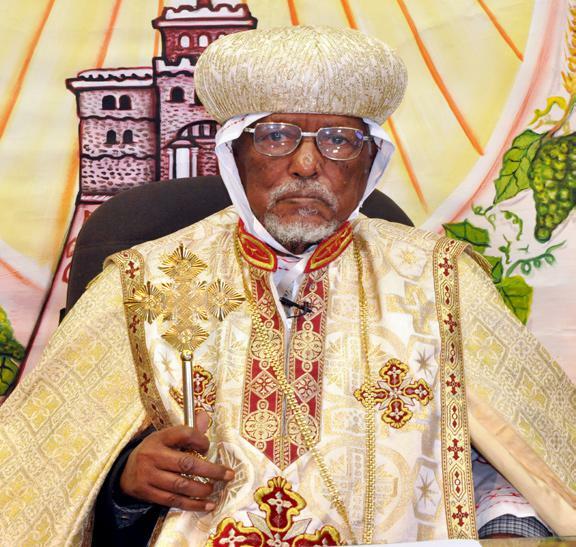 Patriarch Antonios was elected as head of the Eritrean Orthodox Church and within a short time in service, he was forced to be removed from his post and put in prison since 2006. Today, he is under house arrest, making it almost 13 years. Although the Orthodox Church has appointed other Partiarch and continued to do so until the death if the third Patriarch in 2014, the action of removing Patriarch Antonios from his position is unlawful. It has received strong condemnation by sister Oriental Orthodox churches. The damage to the Orthodox Church is quite visible. Now, the Church has two different administration systems working inside and outside Eritrea. The one which is working inside Eritrea is controlled by PFDJ. It has become an instrument in the sustainability of PFDJ dictatorial regime. Outside Eritrea, the Church is further divided into those who oppose the regime but who believe in the oneness of the Church, and other USA based Eritrean Orthodox Church headed by Abune Merkorios which opposes any political meddling in Church affairs. The combined effect of meddling Church and politics has produced a great damage to the once united and strong Eritrean Orthodox church. Note: the cover photo shows the most notorious and main agent of PFDJ inside the Church. He is one of the architect of Banning Pentecost Church and persecution of its members by encouraging the government to take actions. His followers are now scattered throughout the world preaching radical teachings which has zero tolerance against other religions, especially Pentecost. Next Ottomonization of Tigray Region of Ethiopia is in Progress. Will it affect Eritrea?